Comforters are some of the oldest and most popular beddings the world over. Those filled with down are generally considered suitable for many bedrooms owing to their coziness and warmth especially during those chilly, winter seasons. One of the best aspects with comforters is that you can use them as a complement to your bedroom decor while at the same time keeping you warm. On the other hand, you can use them to create an inviting atmosphere which guarantees you a restful night. Size is an important factor to consider when looking for a comforter. As such, it’s important to, first of all, take the measurements of your bed and search for the right comforter with this in mind. Just like other beddings, comforters are available in different sizes ranging from kind king size comforters to queen size to full or double size to twin size. As a general rule, your comforter of choice should be the one size bigger than your mattress in order to provide the perfect covering at night without hogging. The comforter should at least drapes down the bed the same way like a bedspread. Your comforter’s fill power plays a role in its fluffiness and warmth. The high the fill power the warmer the comforter and this also enhances the overall quality of the down comforter. If you are looking for lightweight comforter warmth, it is advisable to pick a comforter that has fill power count of 400. 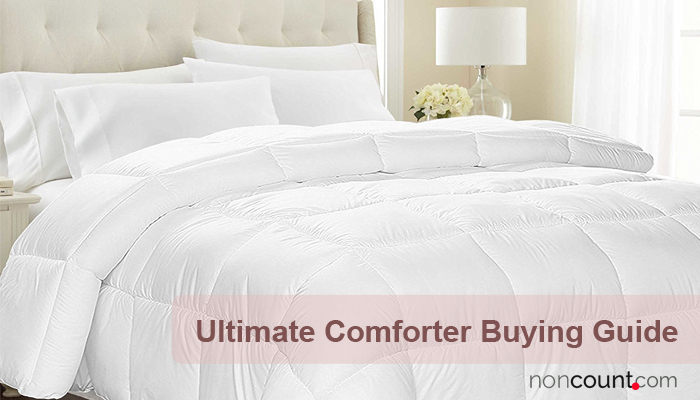 A luxury comforter with the highest insulation normally has to fill power count of 800. It is important to note that fill power is different from fill warmth and these two should not be confused. If you are looking for a loftier feel, go for down material that has higher fill power as these are also higher in quality. The type and weight of fill used in a comforter determine the level of warmth. As such, it is important to choose the type of fill based on the season you intend to be using the comforter or even where you live. The type of down material used will also make the comforter feel fluffier and lighter thus adding to its overall level of comfort. Most of the comforters use natural goose filaments and these provide the comforters with impressive coziness and soft touch. On the other hand, you can also choose those made with duck feathers as these are less expensive compared to goose down comforters. You can also go for synthetic down which is a hypoallergenic choice especially for people with allergy issues. Cotton is the most common shell material for quality down comforters. One of the factors contributing to this is that cotton comforters requires simple care, is relatively cheap comforters and also provides remarkable comfort. High-quality shell material normally features silk blends, cotton blends, and silk. The shell material or ticking holds the down material within the comforter. You should also check the thread count as this also plays an important role when it comes to comforter quality. Comforters with higher thread-count have better quality and therefore more preferable. A thread count of 300 and above is always considered to be a better construction as it prevents the escape of thin down material this keeping it intact. The life of your comforter largely depends on the kind of care you give to it. Always check the kind of care needed to keep your comforter in perfect condition and pick one that you can best care for. Some comforters can be cleaned using a washing machine at home while others require professional dry cleaning. The latter can be a bit costly to maintain but this can also be arrested by using a duvet cover which also helps prevent against wear and tear as well as fill spills. Another important feature for green comforter buying guide has to do with fill weight. This basically means the number of down ounces used in the comforter. Fill weight is different from fill power but the former stands for the comforter heaviness while the latter explains the warmth. Based on the kind of fill used, it is possible to have high fill weight which does not translate to high power. If you live in warmer areas or intend to use your comforter during the warm seasons, it will be advisable to consider a comforter that has high fill weight and low fill power. The combination of the two means that the comforter will be heavy but comfortably warm. What’s the average temperature in your bedroom? Is it cold or warm? Are you generally a cold or warm sleeper? What kind of atmosphere do you like sleeping in? Are you buying a comforter all seasons or do you want to have different ones for specific seasons? These are basically the main features you will need to consider when buying a comforter. 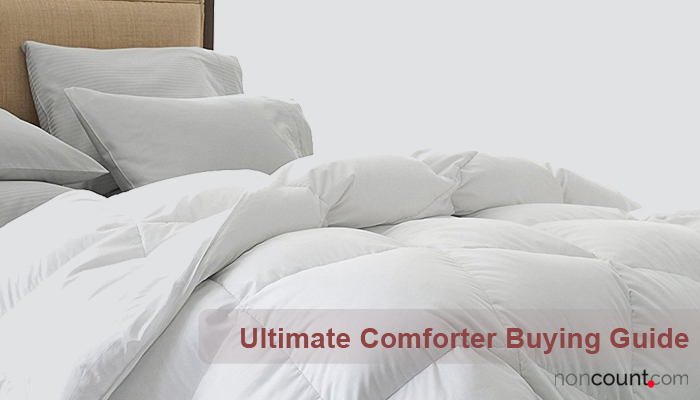 However, there are also other aspects that could come in handy especially if you are buying the comforter for more reasons other than just warmth. Comforters play a great role when it comes to bedroom décor and many people actually consider this when making the purchase. While some white comforters’ colors are available, there are also many others available in various pigments and even designs. If buying with the decor in mind, it is important to consider the color scheme or theme of your bedroom having it in your mind that your bed is the center of focus in the room. The bed upon which you intend to use the comforter also happens to be the biggest object in the bedroom and therefore will draw the attention of everyone who enters in there. It also has a major bearing when it comes to the overall decor in the bedroom. As such, whether looking for a specific tint or shade that’ll match the theme of your children’s bedroom, your bedroom or guest bedroom, always consider a comforter that will add a little bit more interest and give a wow impression. 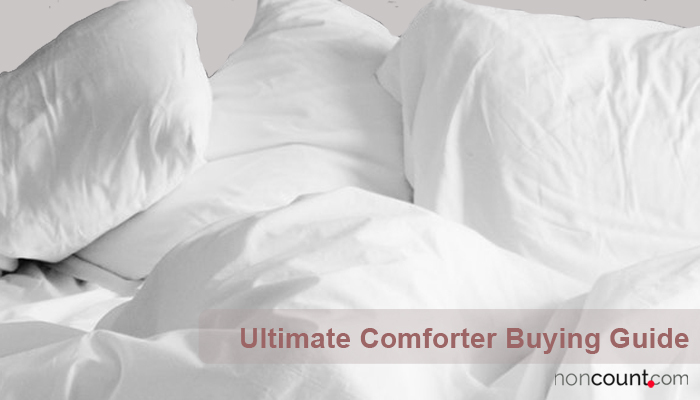 Before buying, it is also important to consider the comforter baffles which are designed to separate the bottom and top parts of the shell thus eliminating any pockets likely to let in cold air. As a matter of fact, comforters that come with baffled shells act as better insulators compared to those with shells that are only sewn through. It is, however, important to note that comforters that have baffled shells cost a little bit more but this is compensated for by the quality. As you purchase a comforter, it will also be important to consider adding a cover to help keep it clean and shield it from dust and stains. These covers normally come with zippers or snaps and are easily removed to facilitate for easier cleaning. Both comforters and covers vary in price and this is largely informed by a number of factors including size, fabric, and design. You can also buy other beddings such as pillows to match with your comforter. This is especially important if you want to enhance the beauty of your bedroom. The quality of the comforter ad comforter cover is largely dependent on the quality but this is not the case in some instances. As such, you might need to consider different providers and pick your comforter from a reliable seller who is able to guarantee good quality and also offer a better price. At the same time, always consider whether those who’ll be using the comforter have allergy issues or not. As you consider this, it will be worth considering something that will work for both those with allergy and those without especially if you are using the comforter in the guest room. With this green comforter buying guide, it will be easy to get the right pick for your needs. The advantage with comforters is that they can last for a long time especially if proper care is taken during the cleaning process and storage. Always follow the instructions given for cleaning and you’ll enjoy your comforter for many years.